Question: I have a newer 8-weight bonefish line that had a minor encounter with a piece of coral. The core of the line doesn’t appear to have been damaged, but there is a half inch or so of the coating that was scraped. That section of line is close enough to the forward taper that my hand encounters it on all but the shortest casts. Can you suggest a way to slick it up? At the current $70 price tag for new lines, I can afford to spend some time trying to heal it. Answer: Aside from the annoyance of feeling the damaged core on every cast, you run the risk of the core absorbing water, which will make the line sink and perform oddly. The best method for repairing a fly-line coating depends on the severity of the injury. In The Orvis Guide to Tackle Care and Repair, Ted Leeson recommends using adhesive to bond the exposed ends of the coating together and to the (undamaged) core. This is ultimately a temporary fix because the adhesive will eventually buckle, crack, or fail because of the constant bending and stretching that a fly line undergoes. However, if you only have to perform this operation a few times a year, it might be worth it. One simple way to repair a nicked fly line is to bend the line and apply Aquaseal® or a cyanoacrylate (CA) glue to the crack. Jim Schollmeyer photo. Wash and dry the damaged area thoroughly. Gently fold the fly line, so that the cut in the line widens, exposing the core. 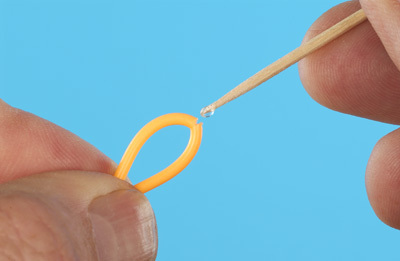 Using the tip of a toothpick, apply a small amount of adhesive to the gap between the coating ends. Make sure some adhesive gets on both ends, as well as on the core. Straighten the line to close the gap. Rotate the line 90 degrees, and fold it again to expose another part of the cut. Repeat the process until all the damage has been repaired. If any adhesive squeezes out onto the line, wipe it off with a toothpick and spread the remainder evenly with a moistened finger. Push the two ends together and hold them for a few minutes, giving the adhesive time to bond. Let the line dry completely before you attempt to use it again. This method doesn’t work for PVC products, which represent the vast majority of fly lines out there, however. Instead, you’ll want to use a heat-shrink sleeve to cover the damaged area. This kind of tubing is often used to attach a braided loop to the end of a fly line, and you can find it at any electrical-supply store, as well. The process is simple, yet easy to screw up if you’re not careful with the heat. Choose shrink-wrap tubing that will just barely fit over the line. Slide a piece of tubing (an inch longer than the damaged area on each side) into place. Hold the damaged section over a light bulb to shrink the sleeve. A light bulb throws off enough heat to shrink the sleeve, but is less likely to burn the coating or melt something you don’t want melted. Unless you have the hands of a brain surgeon, don’t try to shrink the sleeve with a cigarette lighter. After the sleeve has completed shrunk to fit the line over the damaged part, use an X-Acto Knife to trim the sleeve. Cover the whole thing with a soft adhesive to smooth any rough edges. No matter how you make this repair, though, chances are that you’re still going to feel a bump or a sharp spot. So if it’s the feel of the damage that’s really bugging Wayne, he may end up just buying a new line.